ALL INCLUSIVE PACKAGE IN ALL PRICES ON-LINE. Ultra Romantic 5-Course, 1st Class, Gourmet Dinner. Indulgent Private Out-Door Hot Tub on the edge of Nature on the Lake. 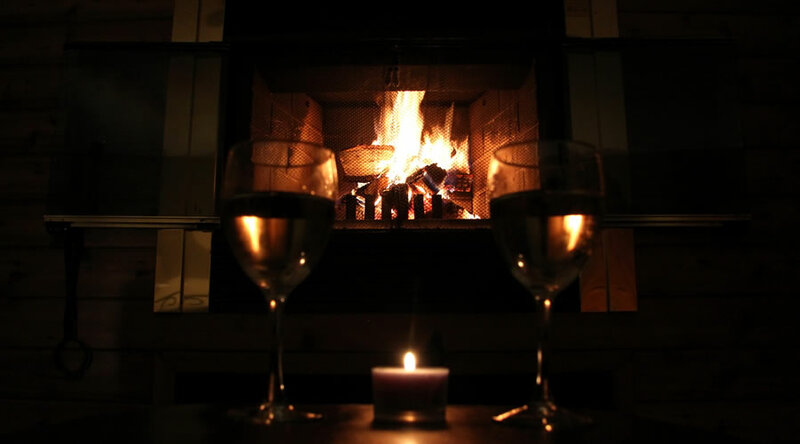 Romantic Real Wood Burning Fireplace, easy to use and real. To make these experiences perfect you may bring your own favourite wine for dinner, your own special bubbles for the In-door Jacuzzi, and we provide the firestarter with the free firewood. Luxury Couples Only - perfect for your special getaways. Algonquin Park for Fresh Air, Wildlife sightings, Trails, Lakes, Museums and Artist Galleries. All Tipping is Included as a Resort Policy (Since many Decades), we are the only Resort that does this in North America. Accommodation size minimum 600 square feet or 60 sq meters. Lake View Accommodation with a Private patio or balcony. Private Outdoor Hot Tub overlooking the Lake. Firestarter and real , easy to use! In-room Double Jacuzzi, bring your special bubbles. King Size Bed with Duvet. 1st Class, 5-Course Gourmet Dinner OR Dinner Room Service. Zero $0.00 Corkage Fee, so bring your Favourite Wine or Champagne to the most Romantic Dinner. Live Entertainment most nights of the Year. Gourmet Breakfast OR Breakfast in bed Service with 2 extra sides. Coffee and Tea at the Dining Room and Bar. Espresso, Latte and Cappuccino at the Bar between the hours of Breakfast and Dinner Service. Algonquin Park Daily Pass for Wildlife Sightings, Trails and Museums. Recreation Room with Billiard Tables, Darts, Shuffleboard. Netflix & Streaming Wifi with the Resorts Fibre-Optics Capabilities. 2 Keurig K-Cups daily in-room. Charging of TESLA and ALL Electric Cars. Best of All the water in the accommodations, by Tap-Water, is from an Algonquin Park Aquifer, the Cleanest Tastiest Water in the World! Rental rates of Sports Equipment. 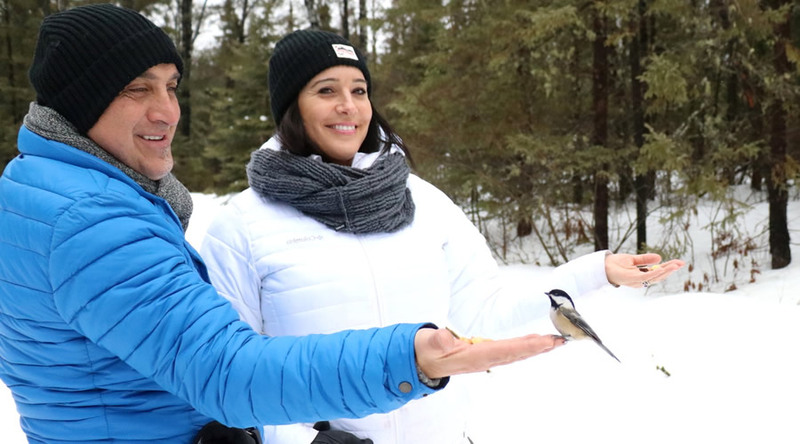 Famous Algonquin Park Birds will eat from your hands. 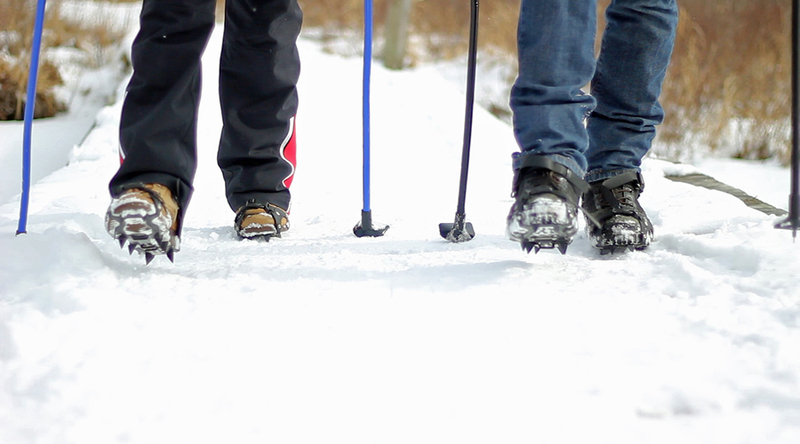 Crampons and ski poles for walking trails from November to April if there is ice or snow on the Algonquin Park Trails. 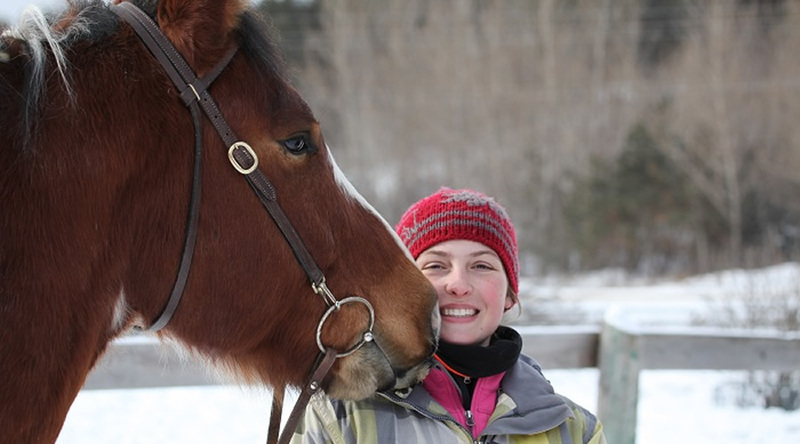 Winter Horse Back Riding: Extra Fee $123.00 / Couple + tax. Romantic 1 hour Horse rides, simply fun! At our Stables in Whitney. Bookings made at our front office. Rent access to a warmup hut on a very quiet Algonquin Park Lake. Walk around the lake and take a break in the Hut. Rent the Hut for Ice Fishing, all Gear Provided. Winter boots, Coats, Gloves. 100% windproof & waterproof pants and jackets plus polar fleece interiors, if needed. Hiking boots, Coats, Gloves. 100% windproof & waterproof pants and jackets plus polar fleece interiors, if needed. We recommend that you bring good hiking shoes. Fishing equipment, rods & lures $20 per day. Romantic Horse rides, simply fun! No allowances for cancelled appointment times. No allowances for equipment failures. Damages to equipment must be paid for. Cannot be used in Conjunction with any other coupons or vouchers or discounts. 13% HST TAX, Lunches, Extra food, Spa Treatments (however, repeat guests receive 2 free 1/2 treatments), Horse Riding (Winter,Spring,Summer,Fall), Italian Deck Boat, Drinks from the Bar, Store, Parking $20 /Night. Spa Products.